I wish words could describe what it is like to be in a room with military and first responder families. Some would think that they have little in common. First responders are addressing the evil in our communities while military is going overseas where we can’t see them everyday. But the Empowered Spouses Retreat through the Chris Kyle Frog Foundation brings these two together on a regular basis, which is why I LOVE working with them. This program in particular takes the spouses of these heroes and gives them four days in the mountains with no connectivity to prove just how much they are heroes as well. We often see in the nonprofit space that there are a hundred and one services and programs for veterans, and sometimes the family. But few, if any, address the spouse only. And this where people get it wrong. We think that veterans have all the influence, and they definitely bring in the donors. But it is the spouse at home that manages the budget, signs kids up for camp, and makes sure the family is on track that holds incredible influence. This is why empowering them to know that about themselves is critical. 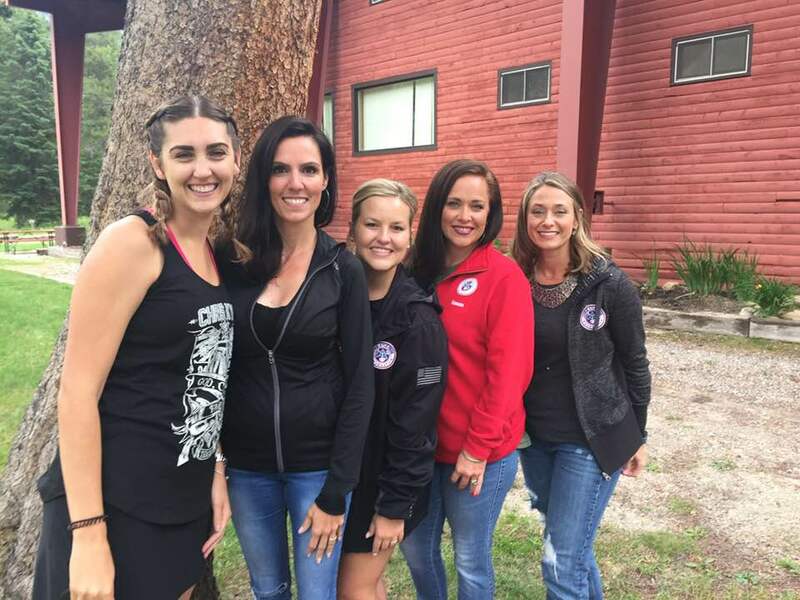 So we, CKFF, take 24 military and first responder wives out to Jackson Hole, Wyoming to build their confidence in new activities that they may not have done before- at least in the presence of each other. They have never met each other and have to immediately do what they do best, be vulnerable in order to find support. Their husbands are at home, watching the kids and perhaps getting to know Murphy’s law. It is a time of self-care, deep reflection, and for me- a chance to meet many of them in person. Those that have been on one of Chris Kyle’s Revitalization Retreats as a couple have spent up to 5 hours with me in online coaching sessions tailored to their needs as a couple. So to see them in person, I am overwhelmed with gratitude, honor, and humility to serve them again. The Tetons command respect and silence, so it is a perfect place for quiet, reflection, and for these women- a chance to hear their spirit speak again. Long has the world and chaotic schedule of the service lifestyle drown out their internal voices. If that wasn’t enough, we take them out of their comfort zone (in front of each other). Many pick up shotguns and archery for the first time. Conquering the fear of kickbacks, loud noises, and even rewriting narratives of negativity associated with weapons. Without their sweet husbands over their shoulder, they find the inner strength to try. That, of course is rewarded by the cheers of those around them who know what they are overcoming. The staff at Safari Club International are not only the most amazing instructors, but have a teaching heart- filled with patience for all who come there. They serve with grace, love, and even the chef and his wife love each person who comes through the door. It wouldn’t be complete if I didn’t push them to a new level emotionally. I guess that is my reputation now, which I had to laugh at. Many of them were afraid of me in sessions, knowing that I would see behind the curtain. Of course, it is in deep love and respect. But I know that what I love is to see people I work with reach inside and discover new truths, break down lies that have long held them back, and find encouragement again. Challenge, sometimes, is what breathes life into us and our family. It may not be comfortable, but it is usually rewarding. Many of these spouses let me dig deep along side of them. Many of them did it on their own, truly embracing the opportunity that was put before them. Every single one of them went home better. My favorite part of all of it is to see them walk back just a little taller than when they came. I could not be more honored to serve along side the amazing staff of CKFF. We all have different talents and together, it is a force to be reckoned with. Every detail is considered, every gift bag made with love, and the trust they have in me as a facilitator leaves me free to do what I love and I do not take that for granted. Special thank you to Taya Kyle for sharing her vision and making it possible to serve these families. We could each not do it by ourselves. Today… I am thankful for a team I have long prayed for. Last weekend I had the honor to befriend 29 beautiful, BADASS women… we laughed, we cried, and we laughed until we cried. We were vulnerable, completely out of our comfort zone, yet we shared some of the rawest and trying times we have ever experienced – not only in our marriages, but in any and every aspect of our lives. Corie dug deep and sometimes without trying. We learned that we have things we can internally work on within ourselves to better our relationships and who can and cannot be invited to a backyard barbeque; we also learned about self-love and that it is perfectly okay to take care of ourselves, as we, military and/or first responder spouses, have an enormous influence on our households, whether our husbands are home or not. Though, we found to have many things in common by the end of the weekend, one thing that stuck out for sure is that love conquers all (1 Corinthians 13) – we love our spouses unconditionally and given our circumstances, being a service member’s spouse isn’t for the faint; it requires strength and sacrifice, yet these women do life so gracefully. We all have a story. We all matter. You matter. Just remember to remind yourself periodically to practice grace, show gratitude, and always, always choose to forgive. My trip to Fort Lewis was a full one! Three events in one trip. I had the honor to again speak with the spouses of special ops soldiers. They have a special place in my heart as they go through a rapid tempo of deployments and trainings. The first event was with a small group who went through Sacred Spaces as a Bible Study. I joined them on the group FB page at various points to connect and encourage them. The following weekend was an opportunity to do another Strengths event for the Fort Lewis PWOC ladies. We went to a gorgeous camp site where we stayed in cabins that looked like train cars. It was a fantastic event that ended in a powerful prayer the ladies did over me and my friend Sarah. I so love these ladies and their prayers (and yours) have more of an impact than you could know. It was another great event at Fort Drum, NY! The women’s PWOC invited the military spouses of Fort Drum to discover their strengths and find a new sense of purpose. Each time I do this, I am more convinced that our military spouses are in need of encouragement now more than ever. With an increase in military tempo around the world and the continued struggle to find employment, spouses are exhausted. What I absolutely LOVE about living out your strengths is that it opens your eyes to who God designed you to be. There may be talents that you don’t even know you have! There may be talents that other people in your life have said were weaknesses- but only because they don’t see the world the way you do. At Fort Drum, spouses were emotional as they discovered the truth about themselves. That there was far more to love about themselves than they thought. Lies from the enemy were shown for what they were and the truth of God prevailed. Lives were changed. Women were set free. Women walked away affirmed in their current purpose and others discovered plans for a new direction in their life. I went back to Washington, DC for the annual Armed Forces Insurance Military Spouse of the Year Awards. The day before, though, is a time for 250 of the most influential military spouses descend on Washington DC to not only network, but be empowered. I was invited to speak at the TownHall and spoke on the Hero’s Journey, sharing the journey that ever super hero must go through in order to find their purpose. By learning to embrace your back story, listen for your calling, and take the risk of adventure, every superhero must then be willing to enter the battle of their lives- themselves. I provided and exciting and inspirational talk that was captured on Facebook Live and was later reproduced as an episode for my podcast. Corie had an amazing opportunity to go to Misawa Air Force Base, Japan to lead 120 women through the Gallup StrengthsFinders. This full day workshop event not only invested in each person’s individual talents, but also in learning how to work better with others. It was an amazing opportunity to invest in an OCONUS installation that often struggles with isolation and depression while being so disconnected from the states. Lasting relationships were built during a fun and meaningful time together. Special thank you to the incredible Women’s Ministry Board for all of their hard work pulling off an incredible event! Day two was all about investing in key leaders to train them up as Coaches in the Gallup StrengthsFinder- a perfect opportunity for mentoring those who attended the outreach event the day before!